Vocabulary knowledge is critical to successful reading comprehension because words carry most of the meaning in a text. 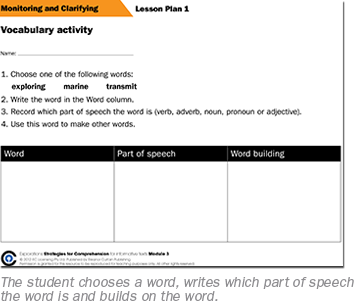 Key vocabulary that is critical for comprehension is identified and discussed with the students. 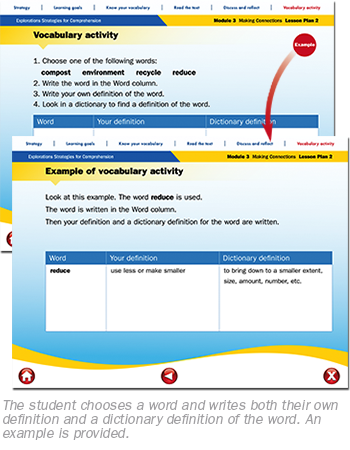 Vocabulary activities for follow-up and reinforcement of meaning are provided. 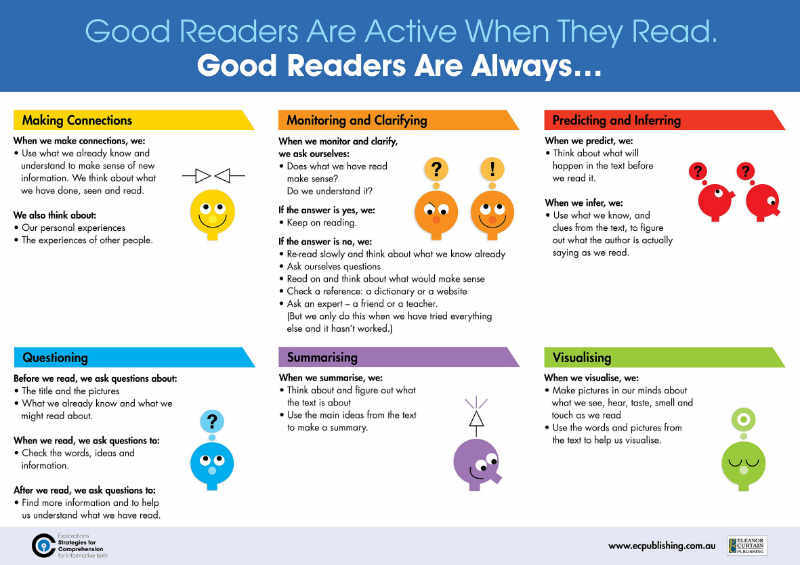 There is much research to show that vocabulary knowledge – the reader’s knowledge and use of the meanings of words and the concepts they relate to – is pivotal to success in reading. The size and depth of vocabulary associated with proficiency in reading comprehension is well proven (NICHD, 2000). Furthermore, it has been shown that instruction that increases students’ vocabulary results in higher levels of reading comprehension (Baumann et al, 2002; Davis, 2007; McKeown & Beck, 2004; Rasinski, Padak, Newton & Newton, 2011) and that building background knowledge of vocabulary is a key element in developing reading success (Marzano, 2004). 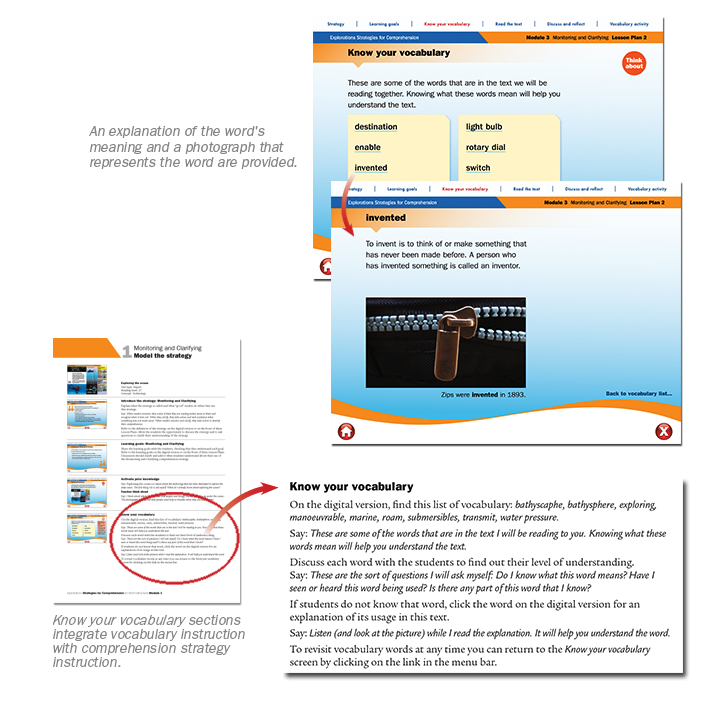 Vocabulary knowledge is a critical aspect of reading comprehension because words carry most of the meaning in a text. Much research (for example, Baumann & Kame’enui, 2004; Blamey & Beauchat, 2011; Graves & Watts-Taffee, 2002; Naggy, 2005) indicates that leaving vocabulary instruction only to incidental learning can be problematic and does not lead to improved student learning. Why the focus on informative texts?